I realized last week that it’s been way too long since I posted a cake roll. I’m sorry, can you forgive me? 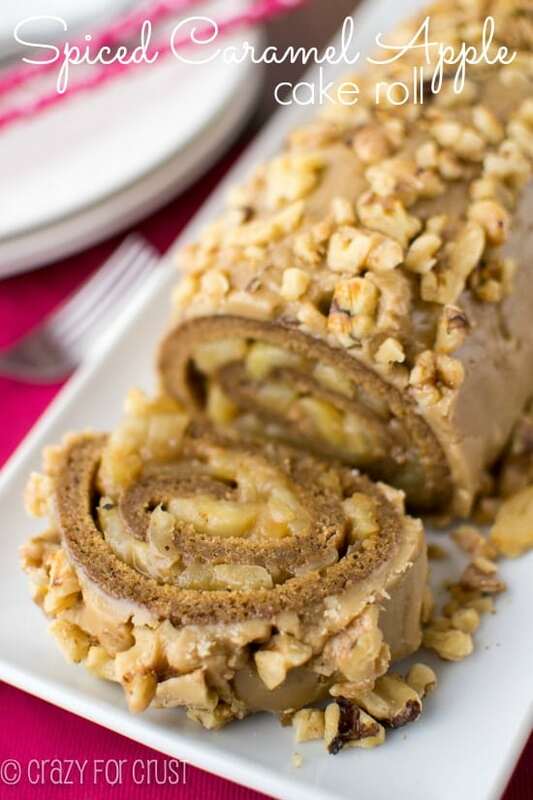 I’ll make it up to you today with my favorite new recipe: an Ice Cream Cake Roll. With neapolitan flavors! So I have a confession to make. Ready? Until last week, I didn’t like strawberry ice cream. I KNOW, right? Weird Dorothy sitting over there doesn’t like ice cream made with the best fruit ever. Are you surprised? You shouldn’t be. So I’ve pretty much gone through life telling myself I didn’t like strawberry ice cream. I’m sure at one point in my childhood I had it and didn’t like it. Most likely it was one of those kinds with huge chunks of strawberries that get all icy and weird. Needless to say, I also didn’t like neapolitan ice cream as a kid. If you don’t like strawberry ice cream, that pretty much rules out neapolitan. Oh my gosh, how much I missed out on as a kid. I’m sad for myself. Anyway, when I was in Tillamook a few weeks ago, I had their strawberry ice cream. And I fell in loooooove. Big, fat, strawberry ice cream love. I had to go to two stores to find the Oregon Strawberry when I got home, because I wanted a huge bowl of it. So I did and then I decided if I didn’t do something with the ice cream I was going to eat the whole carton and that, unfortunately, is not in my eating plan. So I did the logical, food blogger thing. I shoved the ice cream inside of a cake roll. There’s totally less calories that way. I used my favorite chocolate cake roll for this recipe. 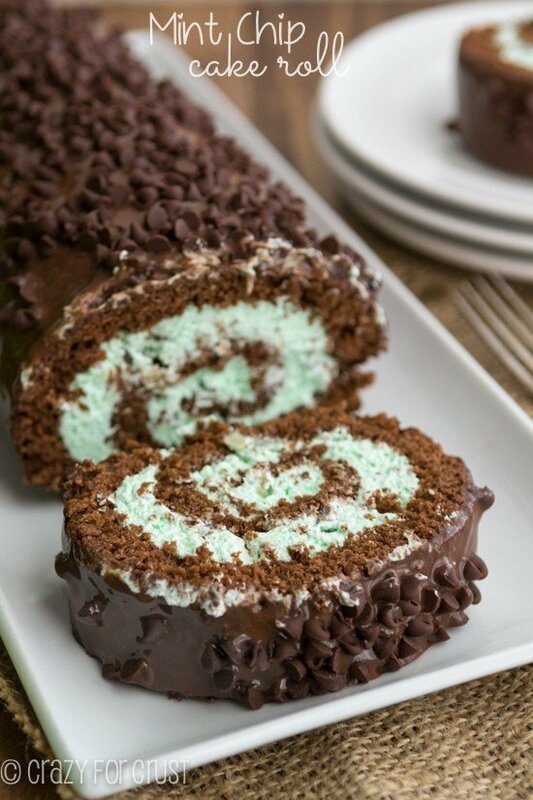 It’s the same one I used for my Mint Chip Cake Roll and it’s similar to one that’s in my book. Then I filled the roll with strawberry ice cream. I used Tillamook because I love their product, but you can use your favorite brand. The strawberry ice cream filling along with the chocolate cake and the whipped cream or Cool Whip topping makes this cake full of neapolitan flavors. 1. Make sure the cake is done. They don’t cook very long – about 10 minutes. Normally I under bake everything, but not cake rolls. It’s almost better if it’s a tad over baked. A toothpick should come out clean in the center of the cake. Again, my cakes always take about 10 minutes. 2. Lots of powdered sugar when rolling. Err on the side of too much. I like to say that if my entire kitchen doesn’t have powdered sugar on it after I flip the cake out of the super hot pan, I didn’t use enough. 3. Cakes crack. It’s going to happen, no matter how many times you’ve baked a cake roll from the same recipe. There are so many variables in play that it’s sometimes unavoidable. In those instances, use lots of frosting. Then no one will know! 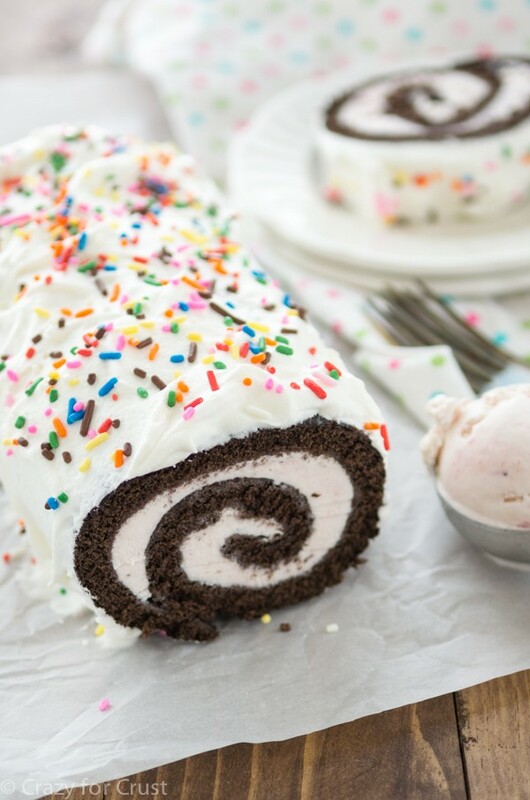 I think ice cream cake rolls are kind of a game changer. Think of the combinations! Do I need to continue? Or are you drooling yet? The perfect chocolate cake roll is filled with strawberry ice cream and topped with whipped cream for a neapolitan ice cream cake roll! 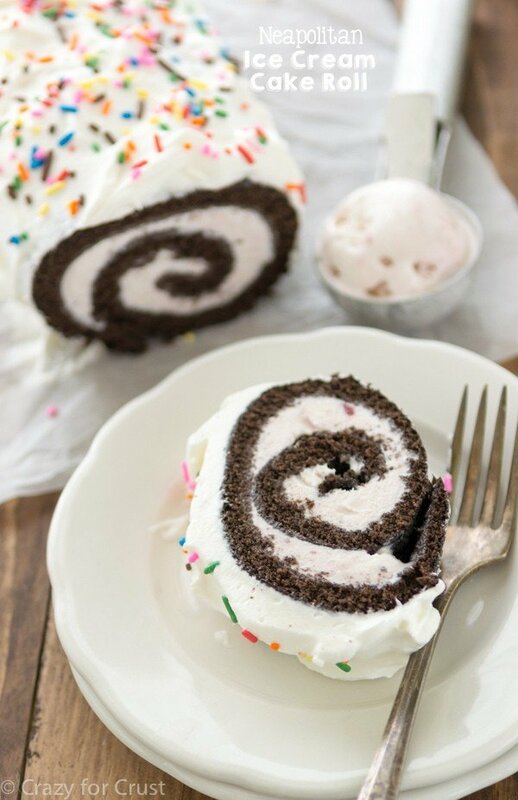 Or, use your favorite flavor ice cream instead to make your perfect ice cream cake roll. Preheat oven to 350°F. Line a jelly roll (10x15”) pan with foil and spray with cooking spray (I like to use the spray with flour). Beat eggs at high speed for 3 minutes, until frothy and dark yellow. Beat in sugar, coffee, and vanilla extract. Working at the short end, fold the edge of the towel over the cake. 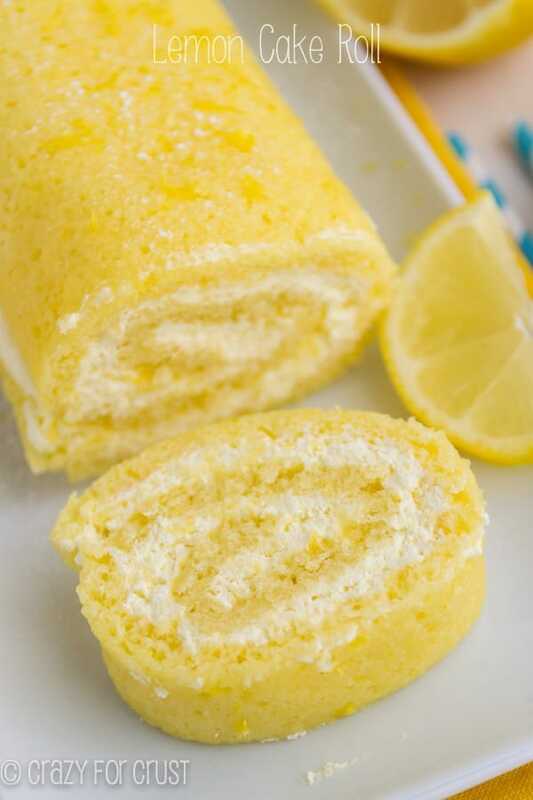 Roll tightly, rolling up the cake into the towel. Let cool completely while rolled, at least one hour (or overnight). Once the cake has cooled, unroll it carefully. Leave ice cream on the counter to soften for 5 minutes. Spread ice cream in an even layer on the cake. Roll up tightly, cover with plastic wrap, and re-freeze for at least 4 hours before serving. When ready to serve, remove cake from the freezer and remove plastic wrap. Place on serving plate and frost with whipped cream or Cool Whip. Top with sprinkles. Get all my No Churn Ice Cream Recipes here. You make the prettiest cake rolls! I love that you stuffed them with ice cream – it sounds incredible! I wasn’t a fan of strawberry ice cream as a kid either but now I can’t get enough of it 🙂 Your tips rock and definitely making me think that I need to attempt making a cake roll one of these days – pinning! I’m pretty much in love with everything about this. Cake rolls are always so much fun. Add in some ice cream and sprinkles and it becomes an over the top celebration. And I am always down for a celebration. Love this!! I still don’t like strawberry ice cream, but that cake roll is gorgeous! I haven’t made a cake roll in years, I need to change that!! Strawberry is the ONLY flavor of ice cream my guy will eat!! (Granted, he’s lactose intolerant, but still… It’s one of the only flavors of froyo and sorbet he’ll eat too.) I was never a huge fan as a kid and always preferred cookie dough or cookies ‘n cream, but stuffed inside of a chocolate cake roll? So good!! Mmmmm, me likely this cake roll! 😉 Neo is the best! I need to make this before the summer is over! Looks amazing, never knew you can make a roll cake with ice cream!